In this image posted on the official Twitter account of the directorate of the Saudi Civil Defense agency, a pilgrim is treated by a medic after a stampede that killed and injured pilgrims in the holy city of Mina. A group of British nationals taking part in the hajj pilgrimage near the holy city of Mecca have escaped a stampede which killed hundreds of people. An agent with the Bradford-based tour operator Omary, which took around 100 people to Saudia Arabia from the north of England, said that none of the party were seriously hurt. Siraj Patel feared the worst when it was reported that at least 453 people had died and more than 700 were injured in the incident at Mina, during the last major rite of the annual Islamic pilgrimage. The death toll has now reached at least 717 people, according to the most recent reports from Saudi Arabia’s civil defence directorate. 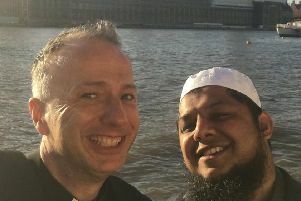 But after contacting his colleague, trip leader Ilyas Master, of Bradford, he was relieved to find that those travelling with Omary were safe. Mr Patel said: “Everyone in our group is fine, there were a few cases of people who could not take the temperature therem but other than that they are okay. “Mr Master is there, all three of the guides are there. I’ve contacted them and got news from them. I was so relieved. Although it is not clear if any British nationals are caught up in the devastation in Mina, the Foreign Office has said it was in contact with authorities. At least 450 other pilgrims have been injured in the crush as Muslims around the world marked Eid al-Adha. In this image posted on the official Twitter account of the directorate of the Saudi Civil Defense agency. Some two million people are taking part in this year’s hajj pilgrimage, which began on Tuesday. Muslims travel to the site in order to throw pebbles and stones at the walls in a symbolic act of stoning of the devil. Amateur video and pictures on social media showed images of dead bodies on the ground dressed in the simple terry cloth garments worn during the hajj. Other pictures show people sitting in wheelchairs and being treated. It is not the first time there has been a crush as people push and shove their way forward to get close to the walls. In 2006 more than 360 pilgrims were killed in a stampede in the same area. Another stampede at Mina in 2004 left 244 pilgrims dead and hundreds injured. The accident comes less than two weeks after a giant construction crane came crashing down on the Grand Mosque in the Saudi city of Mecca, the focal point of the hajj. Father-of-four Qasim Akram, 32, from Bolton, Greater Manchester, was killed in the incident after arriving ahead of the start of the annual pilgrimage. It was his first pilgrimage and had only arrived in the country the morning of the crash. British nationals travel to the pilgrimage each year after saving for the “once in a lifetime trip”. It is estimated that around 25,000 British nationals head overseas from the UK to Saudi Arabia for the hajj, according to Abta, the travel association. Each year pilgrims pay hundreds of thousands of pounds to go on the religious trip, with people spending between £4,000-5,000 for a typical pilgrimage. This year’s hajj takes place between September 21-6.